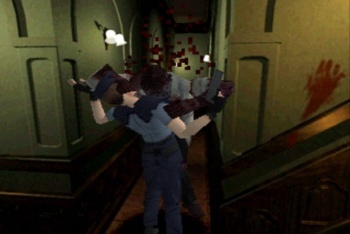 To celebrate the 15th anniversary of Resident Evil, Capcom is re-releasing almost every game in the series. The Resident Evil 15th Anniversary Box comes with a copy of Resident Evil: Director's Cut for the PlayStation, Resident Evil 2 for the PlayStation, Resident Evil 3: Last Escape for the PlayStation, Resident Evil: Revival Selection for the PlayStation 3 (it's an HD remastering of Resident Evil 4 and Resident Evil Code: Veronica Director's Cut), the Resident Evil Code: Veronica soundtrack, the Resident Evil 4 soundtrack, S.T.A.R.S. and Umbrella Corporation 15th anniversary stickers and pins, and a "spacer" for Resident Evil 5 or Resident Evil 5: Gold Edition. There is no official word on whether the Box will ever reach American shores, though gaijin fans can look forward to the arrival of high-definition remakes of both Resident Evil 4 and Resident Evil: Code Veronica X on the Xbox Live Marketplace's Games On Demand service this fall. Though we were already aware of these games, Capcom has let slip that both titles will be issued as the equivalent of full games. Meaning: Both will feature a full 1000 gamerpoints worth of unlockable Achievements, instead of the standard 200 seen in most downloadable titles. However, this also plants a big question mark in the "what are these things going to cost?" section of this story. While the vast majority of standard downloadable games are priced between $10 and $15, the Games On Demand titles are traditionally viewed as full retail games. $60 price tags are not unheard of. Capcom has yet to comment on the pricing issue, though presumably solid details will be emerging shortly. Still, devoted Resident Evil fans should see this anniversary blowout as a prime opportunity to relive the last decade and a half of murderous zombies, Eurotrash bioterrorists and inexplicable underground shark attacks. Or, failing that, a solid excuse to slip the phrase "Itchy. Tasty." back into everyday parlance.